Code Geass: Lelouch of the Rebellion (コードギアス 反逆のルルーシュ Kōdo Giasu: Hangyaku no Rurūshu? ), often referred to as simply Code Geass, is a Japanese anime series created by Sunrise, directed by Gorō Taniguchi, and written by Ichirō Ōkouchi, with original character designs by Clamp. Code Geass first ran in Japan on MBS from October 5, 2006, to July 28, 2007. Its sequel series, Code Geass: Lelouch of the Rebellion R2 (コードギアス 反逆のルルーシュR2 Kōdo Giasu Hangyaku no Rurūshu Āru Tsū? ), ran on MBS and TBS from April 6, 2008 to September 28, 2008. Both seasons have won several awards at the Tokyo International Anime Fair, Animage Anime Grand Prix, and Animation Kobe event. Jean Baptiste Charles Dancla (19 December 1817 in Bagnères-de-Bigorre – 10 October 1907 in Tunis) was a French violinist and composer. When Dancla was nine years old the violinist Pierre Rode in Bordeaux heard his music; he was so impressed that he sent a recommendation letter to Pierre Baillot, Luigi Cherubini and Rodolphe Kreutzer. Thus Dancla became pupil to Paris conservatoires with Baillot for violin and with the opera composer Fromental Halévy for composition. He was strongly shaped by Niccolò Paganini, who experienced him in 1830, as well as by Henri Vieuxtemps. From 1835 onward Dancla was solo violinist in that Paris opera, and shortly thereafter he became concert master. In the year 1857 he was made a Professor to Paris conservatoires, where he was a successful teacher for over 35 years. 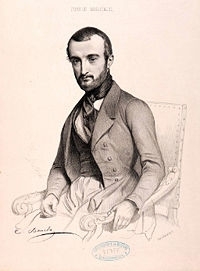 His two brothers were Arnaud Dancla (1819-1862), Cellist and author of a considerable cello teaching method, and Leopold Dancla (1822-1895), Violinist and composer of chamber music. Moritz (Maurice) Moszkowski (23 August 1854 – 4 March 1925) was a German composer, pianist, and teacher of Polish descent. Ignacy Paderewski said, "After Chopin, Moszkowski best understands how to write for the piano". 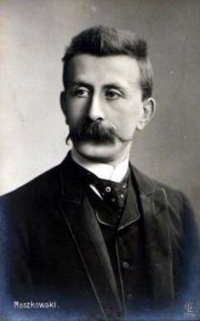 Although little known today, Moszkowski was well-respected and popular during the late nineteenth century. His music is brilliant, but has also been described as "devoid of the masculine and the feminine". He wrote over two hundred small-scale piano pieces, which brought him much popularity – notably his set of Spanish Dances, Op. 12, for piano duet (later arranged for solo piano, and for orchestra ). His early Serenade, Op. 15, was world-famous and appeared in many guises, including the song Liebe, kleine Nachtigall. Today he is probably best known for his fifteen Études de Virtuosité, Op. 72, which have been performed by virtuoso pianists such as Vladimir Horowitz and Marc-André Hamelin. Surprisingly, their first complete recording was not until 1970 (by Ilana Vered). 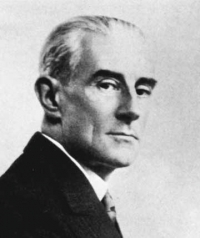 Many of his small but brilliant piano pieces, such as Étincelles (Sparks), are used as encore performances at the end of classical concerts. He also wrote larger scale works including the Piano Concerto in E major, Op. 59 (1898), the Violin Concerto in C major, Op. 30, three orchestral suites (Opp. 39, 47, 79), and a symphonic poem Jeanne d'Arc, Op. 19. He wrote the opera Boabdil der letzte Maurenkönig, Op. 49, on the historical theme of the capture of Granada. It was premiered at the Berlin Court Opera on 21 April 1892, and appeared in Prague and New York the following year. It did not stay in the repertoire, but its ballet music was very popular for a number of years. He wrote a three-act ballet Laurin in 1896. Digimon (デジモン Dejimon? ), short for "Digital Monsters" (デジタルモンスター Dejitaru Monsutā? ), is a Japanese media franchise encompassing anime, manga, toys, video games, trading card games and other media. The franchise's eponymous creatures are monsters of various forms living in a "Digital World", a parallel universe that originated from Earth's various communication networks. Wilhelm Richard Wagner (pronounced /ˈvɑːɡnər/, German pronunciation: ; 22 May 1813 – 13 February 1883) was a German composer, conductor, theatre director and essayist, primarily known for his operas (or "music dramas", as they were later called). Wagner's compositions, particularly those of his later period, are notable for their complex texture, rich harmonies and orchestration, and the elaborate use of leitmotifs: musical themes associated with individual characters, places, ideas or plot elements. 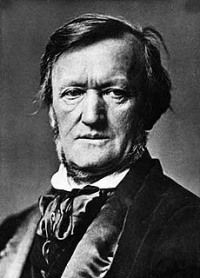 Unlike most other opera composers, Wagner wrote both the music and libretto for every one of his stage works. Famous extracts from his operas include the "Ride of the Valkyries" and the Bridal Chorus from Lohengrin, popularly known as the wedding march "Here Comes the Bride". Initially establishing his reputation as a composer of works such as The Flying Dutchman and Tannhäuser which were in the romantic traditions of Weber and Meyerbeer, Wagner transformed operatic thought through his concept of the Gesamtkunstwerk ("total work of art"). This would achieve the synthesis of all the poetic, visual, musical and dramatic arts, and was announced in a series of essays between 1849 and 1852. Wagner realised this concept most fully in the first half of the monumental four-opera cycle Der Ring des Nibelungen. However, his thoughts on the relative importance of music and drama were to change again and he reintroduced some traditional operatic forms into his last few stage works including Die Meistersinger von Nürnberg. Wagner pioneered advances in musical language, such as extreme chromaticism and quickly shifting tonal centres, which greatly influenced the development of European classical music. His Tristan und Isolde is sometimes described as marking the start of modern music. Wagner's influence spread beyond music into philosophy, literature, the visual arts and theatre. He had his own opera house built, the Bayreuth Festspielhaus, which contained many novel design features. It was here that the Ring and Parsifal received their premieres and where his most important stage works continue to be performed today in an annual festival run by his descendants. Wagner's views on conducting were also highly influential. His extensive writings on music, drama and politics have all attracted extensive comment; not least for their frequently antisemitic content. Wagner achieved all of this despite a life characterised, until his last decades, by political exile, turbulent love affairs, poverty and repeated flight from his creditors. His pugnacious personality and often outspoken views on music, politics and society made him a controversial figure during his life. He has remained one to this day. The impact of his his ideas can be traced in many of the arts throughout the twentieth century. 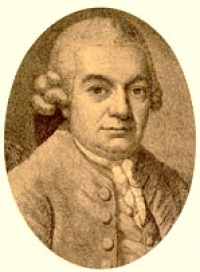 Carl Philipp Emanuel Bach (8 March 1714 – 14 December 1788) was a German musician and composer, the second of three sons of Johann Sebastian Bach and Maria Barbara Bach. 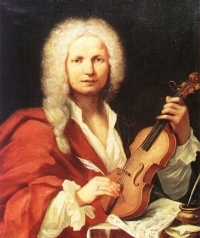 He was a crucial composer in the transition between the Baroque and Classical periods, and one of the founders of the Classical style, composing in the Rococo and Classical periods. His second name was given in honor of Georg Philipp Telemann, a friend of Emanuel's father and his godfather. Through the latter half of the 18th century, the reputation of Emanuel Bach stood very high. Wolfgang Amadeus Mozart said of him, "He is the father, we are the children." The best part of Joseph Haydn's training was derived from a study of his work. Ludwig van Beethoven expressed for his genius the most cordial admiration and regard. This position he owes mainly to his keyboard sonatas, which mark an important epoch in the history of musical form. Lucid in style, delicate and tender in expression, they are even more notable for the freedom and variety of their structural design; they break away altogether from both the Italian and the Viennese schools, moving instead toward the cyclical and improvisatory forms that would become common several generations later. The content of his work is full of invention and, most importantly, extreme unpredictability, and wide emotional range even within a single work, a style that may be categorised as Empfindsamer Stil. It is no less sincere in thought than polished and felicitous in phrase. He was probably the first composer of eminence who made free use of harmonic colour for its own sake since the time of Lassus, Monteverdi, and Gesualdo. In this way, he compares well with the most important representatives of the First Viennese School. In fact he exerted enormous influence on the North German School of composers, in particular Georg Anton Benda, Bernhard Joachim Hagen, Ernst Wilhelm Wolf, Johann Gottfried Müthel, Friedrich Wilhelm Rust and many others. His influence was not limited to his contemporaries, and extended to Felix Mendelssohn and Carl Maria von Weber. 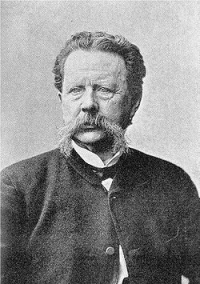 Gunnar Wennerberg (Lidköping 2 October 1817 – Läckö 24 August 1901), Swedish poet, composer and politician. His niece Sara Wennerberg-Reuter (1875–1959) was also a well-known musician; she was an organist and composer. Wennerberg was the son of the vicar of the town of Lidköping in Västergötland, went to gymnasium in the cathedral town of Skara, and matriculated as a student at Uppsala University in 1837, where he studied natural sciences, Classical philology, Philosophy and Aesthetics. He received his filosofie magister degree in 1845 and became a docent of Aesthetics in 1846. Wennerberg was remarkable in several ways, handsome in face and tall in figure, with a finely trained singing voice, and brilliant in wit and conversation. From the outset of his career he was accepted in the inner circle of men of light and leading for which the university was at that time famous. In 1843 he became a member of the secret society and musical club who called themselves The Juvenals, and for their meetings were written the trios and duets, music and words, which Wennerberg began to publish in 1846. In the following year appeared the earliest numbers of Gluntarne (or "The Boys"), thirty duets for baritone and bass, which continued to be issued from 1847 to 1850. The success of these remarkable productions, masterpieces in two arts, was overwhelming: they presented an epitome of all that was most unusual and most attractive in the curious university life of Sweden. Wolfgang Amadeus Mozart (German: , full baptismal name Johannes Chrysostomus Wolfgangus Theophilus Mozart (27 January 1756 – 5 December 1791), was a prolific and influential composer of the Classical era. He composed over 600 works, many acknowledged as pinnacles of symphonic, concertante, chamber, piano, operatic, and choral music. He is among the most enduringly popular of classical composers. Mozart showed prodigious ability from his earliest childhood in Salzburg. 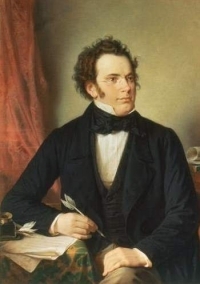 Already competent on keyboard and violin, he composed from the age of five and performed before European royalty; at 17 he was engaged as a court musician in Salzburg, but grew restless and traveled in search of a better position, always composing abundantly. While visiting Vienna in 1781, he was dismissed from his Salzburg position. He chose to stay in the capital, where he achieved fame but little financial security. During his final years in Vienna, he composed many of his best-known symphonies, concertos, and operas, and the Requiem. The circumstances of his early death have been much mythologized. He was survived by his wife Constanze and two sons. 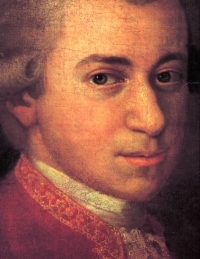 Mozart learned voraciously from others, and developed a brilliance and maturity of style that encompassed the light and graceful along with the dark and passionate—the whole informed by a vision of humanity "redeemed through art, forgiven, and reconciled with nature and the absolute." His influence on subsequent Western art music is profound. Beethoven wrote his own early compositions in the shadow of Mozart, of whom Joseph Haydn wrote that "posterity will not see such a talent again in 100 years." Nicanor Sta. Ana Abelardo (February 7, 1893 – March 21, 1934) was a Filipino composer who composed over a hundred of Kundiman songs, especially before the Second World War. Carl August Nielsen (9 June 1865 – 3 October 1931), widely recognised as Denmark's greatest composer, was also a conductor and a violinist. Brought up by poor but musically talented parents on the island of Funen, he demonstrated his musical abilities at an early age. While it was some time before his works were fully appreciated, even in his home country, Nielsen has now firmly entered the international repertoire. Especially in Europe and the United States, Nielsen's music is ever more frequently performed, with interest growing in other countries too. 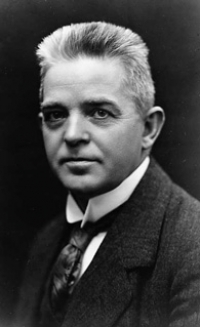 Carl Nielsen is especially admired for his six symphonies, his Wind Quintet and his concertos for violin, flute and clarinet. In Denmark, his opera Maskarade and a considerable number of his songs have become an integral part of the national heritage. While his early music was inspired by composers such as Brahms and Grieg, he soon started to develop his own style, first experimenting with progressive tonality and later diverging even more radically from the standards of composition still common at the time. For many years, he appeared on the Danish hundred-kroner banknote. 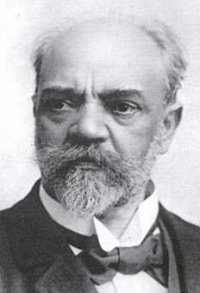 Nielsen is best known for his six symphonies. Other well-known pieces are the incidental music for Adam Oehlenschläger's drama Aladdin, the operas Saul og David and Maskarade, the three concertos for violin, flute and clarinet, the Wind Quintet, and the Helios Overture, which depicts the passage of the sun in the sky from dawn to nightfall. Most Danes can sing many of the numerous songs by various poets, set to music by Carl Nielsen. The music initially had a neo-classical sound but became increasingly modern as Nielsen developed his own approach to what Robert Simpson called progressive tonality, moving from one key to another. Typically, he would end on a different key, sometimes as the outcome of a struggle as in his symphonies. His frequently blended melodic passages inspired by folk music with more complicated stylings including counterpoint and modern variations. Like his contemporary, the Finn Jean Sibelius, he studied Renaissance polyphony closely, which accounts for much of the melodic and harmonic "feel" of his music. OneRepublic is an American Rock band formed in Colorado. After a few years of moderate success, they have since drawn mainstream attention with the release of their single "Apologize," which has sold in excess of 7 million singles worldwide. The song, according to SoundScan Data, is one of only two songs that have reached 3 million legal downloads in history. A remix of "Apologize" was featured on Timbaland's Shock Value and the band's debut album, Dreaming Out Loud, produced by Greg Wells. Their debut album was released in the United States on November 20, 2007, with international release dates staggered throughout early 2008. As of June 14, 2008, Dreaming Out Loud had sold 761,298 copies in the U.S. with the bands total album sales coming to over 1.5 million worldwide so far. The band's second single, "Stop and Stare," has also crossed the 2 million mark in terms of worldwide single sales. Their third single, "Say (All I Need)", has been released in the UK and in the U.S. Their fourth single will be "Mercy", as stated by OneRepublic's MySpace page. The video has been streamed on Youtube.com. Ferruccio (Dante Michelangelo Benvenuto) Busoni (April 1, 1866 – July 27, 1924) was an Italian composer, pianist, editor, writer, piano and composition teacher, and conductor. Most of Busoni's works are for the piano. Busoni's music is typically contrapuntally complex, with several melodic lines unwinding at once. Although his music is never entirely atonal in the Schoenbergian sense, his mature works, beginning with the Elegies, are often in indeterminate key. He was in contact with Schoenberg, and made a 'concert interpretation' of the latter's 'atonal' Piano Piece, Op. 11, No. 2 (BV B 97), in 1909. In the program notes for the premiere of his own Sonatina seconda of 1912, Busoni calls the work senza tonalità (without tonality). Johann Sebastian Bach and Franz Liszt were key influences, though late in his career much of his music has a neo-classical bent, and includes melodies resembling Mozart's. Many of Busoni's works are based on music of the past, especially on the music of Johann Sebastian Bach (see below). The first version of Busoni's largest and best known solo piano work, Fantasia Contrappuntistica, was published in 1910. About half an hour in length, it is essentially an extended fantasy on the final incomplete fugue from Bach's The Art of Fugue. It uses several melodic figures found in Bach's work, most notably the BACH motif (B flat, A, C, B natural). 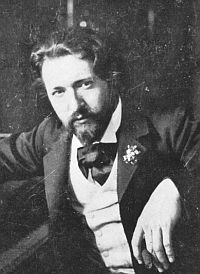 Busoni revised the work a number of times and arranged it for two pianos. Versions have also been made for organ and for orchestra. Antonio Bartolomeo Bruni (January 28, 1757 – August 6, 1821) was an Italian violinist, composer and conductor. Bruni was born and died in Cuneo, Italy. During most of his life he resided, played and composed in Paris. 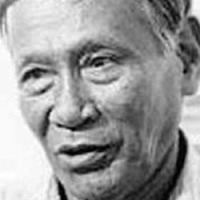 Levi Celerio (April 30, 1910 – April 2, 2002) was a Filipino composer and lyricist. Celerio was a prolific songwriter, with over 4,000 songs to his credit. He is perhaps best known for being a leaf-player, a feat for which he was put into the Guinness Book of World Records. In 1997, he was named National Artist of the Philippines for Music. 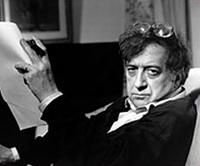 Luciano Berio, Cavaliere di Gran Croce OMRI (October 24, 1925 – May 27, 2003) was an Italian composer. He is noted for his experimental work (in particular his 1968 composition Sinfonia for voices and orchestra and his series of numbered solo pieces titled Sequenza) and also for his pioneering work in electronic music. Berio's electronic work dates for the most part from his time at Milan's Studio di Fonologia. One of the most influential works he produced there was Thema (Omaggio a Joyce) (1958), based on Cathy Berberian reading from James Joyce's Ulysses. A later work, Visage (1961) sees Berio creating a wordless emotional language by cutting up and rearranging a recording of Cathy Berberian's voice. In 1968, Berio completed O King a work which exists in two versions: one for voice, flute, clarinet, violin, cello and piano, the other for eight voices and orchestra. The piece is in memory of Martin Luther King, who had been assassinated shortly before its composition. In it, the voice(s) intones first the vowels, and then the consonants which make up his name, only stringing them together to give his name in full in the final bars. The orchestral version of O King was, shortly after its completion, integrated into what is perhaps Berio's most famous work, Sinfonia (1967–69), for orchestra and eight amplified voices. The voices are not used in a traditional classical way; they frequently do not sing at all, but speak, whisper and shout. The third movement is a collage of literary and musical quotations. A-Ronne (1974) is similarly collaged, but with the focus more squarely on the voice. It was originally written as a radio program for five actors, and reworked in 1975 for eight vocalists and an optional keyboard part. The work is one of a number of collaborations with the poet Edoardo Sanguineti, who for this piece provided a text full of quotations from sources including the Bible, T. S. Eliot and Karl Marx.